Today we have one shop to visit. Today is Holland Stoffenhuis. A great shop that happens to be one of our newest Resellers for paper patterns. Go check it out. Also, one of our favorite testers works there. Isn’t that awesome. What’s not to love about this shop…. But, back to where you came here for. Visit them on their Facebook or Instagram to maybe win one Eximia Sweater pattern. We are more than halfway on our celebrations. Are you enjoying yourself? We are! Today we have another two great shops to visit. Visit Ansje Handmade and check out her beautiful handmade items and fabrics. After you did that go and visit Mon Depot. Such a beautiful collection they have. Just amazing. Ansje Handmade can also be found on Facebook and Instagram. Mon Depot can also be found on Facebook and Instagram. By now you should have found out about our release celebration…… You still have a total of 12 chances to win one of the Eximia Sweater patterns. Yes that many! To win today, all you have to do is find one of the two shops that are celebrating with us. The first shop is Stoffenfeest. Find Stoffenfeest on their Facebook or Instagram and join the fun. Or go and see what Joyfits has to offer. (We can tell you she has a lot…..) Go to their Facebook page or Instagram and follow the requirements. On Monday, the Eximia Sweater will be released. This is the first pattern after Anne’s maternity leave. So time for a celebration. We found 15 Dutch, French and Belgium fabric shops who offered to help us celebrate. Isn’t that great! How do we celebrate you ask? Let me tell you. Ook al ben ik uit de rompers, ik vind ze ontzettend leuk om te maken en als (kraam-)cadeautje te geven. In deze gastblog beschrijf ik een andere manier van het aanzetten van de biaisband bij rompers. Even though I don’t have kids that wear onesies anymore, I love making them as gifts. In this guest post I show another way to attach the binding to the bottom of the onesies. In de beschrijving van zowel de ADV als de Sylva romper wordt beschreven hoe je de biaisband aan de onderzijde vastzet wanneer het lijfje aan één zijde gesloten is. Na het aanzetten van het biaisband sluit je dan het lijf waarna je de zijnaad naar achteren vast zet. Ik vind het mooier wanneer de onderzijde allemaal uit 1 stuk lijkt te zijn, daarom zet ik de biaisband op een andere manier aan. Almost two months ago miss Rainbow was born. Two months before her birth we released our first onesie pattern and today we are releasing the second. Today, we are releasing the Sylva Onesie, the little sister of our popular Sylva Shirt and Tunic. The Sylva Onesie has the same symmetrical V shaped neckline that will make dressing your little one easy. 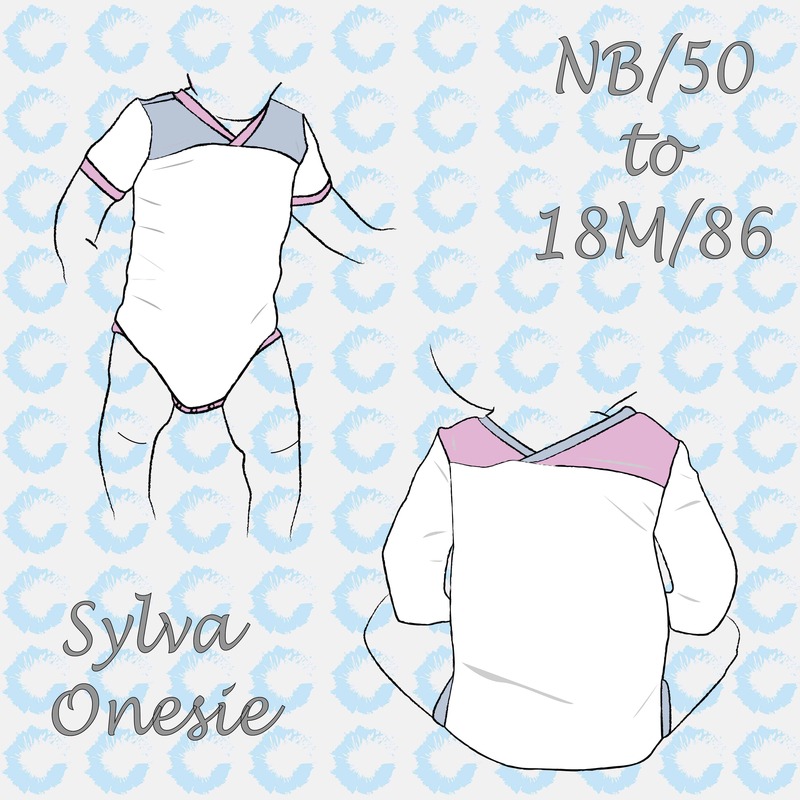 In contrast to the Sylva shirt, the Sylva Onesie is a unisex pattern. The unique V shape is suitable for both girls and boys. The Sylva onesie comes in both short and long sleeves. Let’s start out with some pictures of Miss Rainbow herself. We showed her off on Instagram already, but we did not show her on the blog yet. Both onesies have extra special fabric. You will not have to guess why the rainbow colored fabric is special, but the grey one is extra fun because in that same fabric Anne wore a Vallis during pregnancy. A onesie in general is perfect for using treasured fabric due to the size of the garment, but the color block of the Sylva makes the pattern extra suitable, because even smaller fabric remnants can be turned into unique garments. Vandaag laat ik zien hoe je een bomberkraag aan de Cicero of de Foliis kan zetten. Today I will show you how to make the Bomber collar for the Cicero or Foliis.